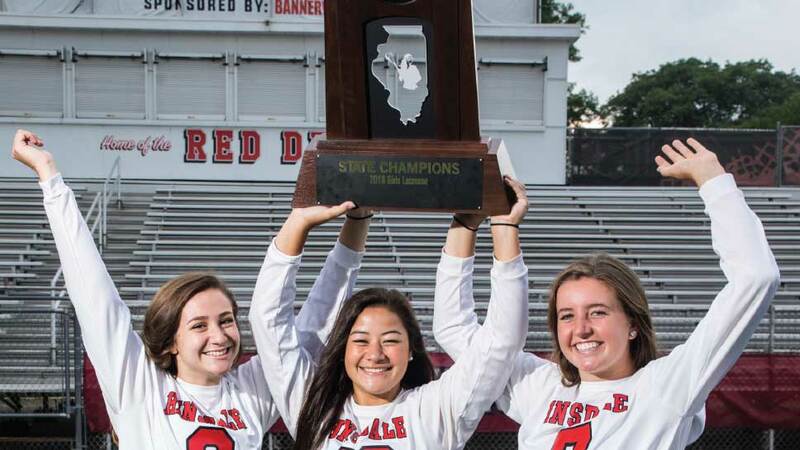 Just like the Hinsdale Central girls’ lacrosse team’s state championship run, recent graduate Jayne Gelman seized an opportunity during the victory party. This summer has been quite a ride for the Red Devils after a groundbreaking season. On their home Dickinson Field, they won the sport’s first Illinois High School Association state tournament by defeating New Trier 13-3 on June 2. That followed a resounding 8-5 semifinal victory over Loyola Academy, which had won nine straight Illinois High School Women’s Lacrosse Association state tournaments. Recent graduates Lally Johnson and Maria Mulvihill, rising seniors Sam Brescia, Syd Collignon, and Kristiana Strtak and rising junior Jenna Collignon were first-team all-state. Recent graduate Shea Draddy, Hamood, and rising junior Madeline Pisani were all-state honorable mention. Recent graduates Kelsie Chisholm, Maura Mulligan, and Kendall Napier, along with rising juniors Olivia Beargie and Jessica Joy, also started in the final. Other players were recent graduates Amaris Hernandez and Cassie Kruse, rising seniors Sara Draddy, Ella Farrell, and Anasthasia Shilov, and rising sophomores Charlotte Callahan, Elizabeth Farrah, and Avery Secola. Winning state at home exceeded expectations. Mulvihill was impressed by the “sea of red” in the stands from the usual parents but also numerous friends, some watching lacrosse for the first time. Like New Trier and Loyola, the Red Devils annually have reached the state semifinals since 2006. But since their 2007 title, they finished second to Loyola in 2015 and 2011. And defeat on consecutive days. The Red Devils lost to New Trier 11-9 on May 17 but controlled the finals behind seven unanswered goals after an early 2-1 deficit. Hinsdale Central led Loyola throughout the semifinals after a 3-0 start. Draddy, Gelman, and Mulvihill were team captains. The seniors led the program’s first organized Animal Farm morning workouts that third-year head coach Dan Hartman conducts as head varsity football coach. Hartman encouraged further bonding by going to breakfast or players’ houses to watch lacrosse footage. One Saturday morning, Hartman cancelled practice but ordered the players to do something collectively. Another time, the coaching staff personally took them for breakfast at Patti’s Sunrise Café in Burr Ridge. The road to success also included a two-block walk to the Collignon home for state pre- and post-game gatherings. At the victory party, the Red Devils circled and sang with “We Are the Champions” blasting from speakers, surrounded by parents, alumni, and plenty of sandwiches and mini-tacos. Trophy sharing among players started at the banquet. Before returning for the start of school, the trophy has appeared in Hinsdale’s Fourth of July parade and throughout the Chicago area. The Collignons brought it to their grandfather, a season-long fan unable to attend state.